Slightly heavy tail-end feel; Those damn side reflectors – what were they thinking? After months of consideration about what my next car should look like, I finally arrived at the non-negotiable selection of a four-door high-performance coupe with enough practicality to be a daily drive around town. This meant taking the leap of ruling out all SUVs and wagons, which really doesn’t leave you with much of a shopping list. If price were not a concern, then I would happily jump straight into a Porsche Panamera or Audi S5 Sportback, but armed with a budget of $65K, I figured half a car or less was not going to cut it. 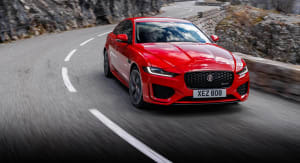 So, my search then finally narrowed down to two options in the Kia Stinger and VW Arteon; the latter of which was ruled out by its smaller four-cylinder pot, shorter three-year warranty and more austere Passat-like design. With those classic gran turismo lines, long nose and Coke bottle curves, the Stinger has an instant presence about it. 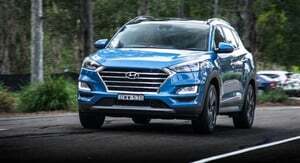 To put its proportions into perspective, it stands lower than the baby Kia Picanto, while at the same time being longer than its other stable mate in the Sorento seven-seat SUV. On the inside, first impressions again share a sense of drama with its unfussy cabin layout, dark suede roof liner and, in my case, red Nappa leather. You now start to understand why Kia created this car with a European design team, as the result is more akin to something from the Maserati line-up than anything sharing a Kia badge. 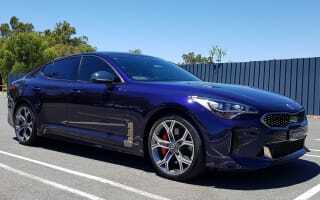 In terms of technology and safety kit, this top-spec GT model really does want for nothing, as Kia has thrown in everything including the kitchen sink. There’s a feature list that European brands would mostly consider optional and subsequently very expensive. The engine and shift-by-wire transmission mate very well to deliver incredible torque from the instant your foot touches the pedal. At the same time, it’s devoid of any turbo lag and gear transitions in any direction are excellent, never struggling to find the right one at the right time. One of the downsides of its liftback design is the added weight at the tail, which can be evident around corners. 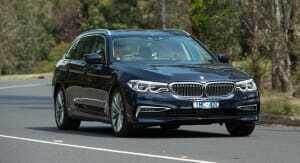 But overall handling, especially in sports mode, is excellent with its Nürburgring development pedigree clearly evident. Cabin road noise levels are very low with excellent insulation through the body and dual-pane acoustic window glass, so when cruising around town, the drive feels calm and effortless. Then on the flipside, when you feel the need to open it up, there is a phenomenal and instant supply of V8-level power. My expectation before owning the Stinger, with its well-documented performance credentials, was a constant desire to plant the foot. However, this calm-to-crazy split personality is possibly the car’s greatest attribute, as you can really enjoy the driving experience in any situation. 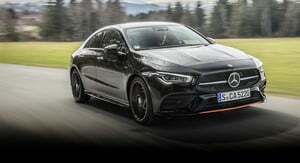 This also goes some way to explain its varied fuel efficiency from less than a frugal 8L/100km on the open road and climbing up to a thirsty 13L/100km or more around town – especially when you on occasion like to take advantage of its special skill set. More than 12 months after purchase and 15,000km behind me, the only issue that presented was a mild droning noise from the rear diff when reversing and turning at low speed. This is a known problem with early production models, and was quickly rectified by the dealership with the diff being replaced without fuss or delay. With a family of four, we couldn’t be more comfortable in the Stinger around town, but let me be clear, it is no weekend family getaway machine. So anyone looking for this level of practicality and space won’t find it here, and shouldn’t expect it at the same time in a car designed for pace with grace. Yes, it may have a reasonably large boot at over 400 litres, but it is long and low, and anything larger than an average esky size will be too tall to fit under the parcel shelf – and don’t even think about fishing rods! There has been a lot of criticism of the car’s engine note, or lack thereof, but I don’t believe this is a negative and have no intention of forking out $3K for the optional bi-modal exhaust. 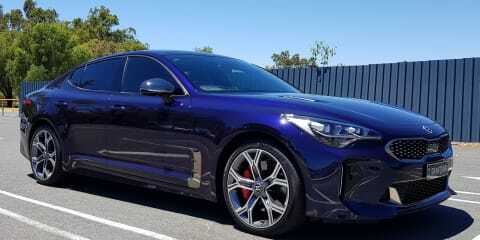 I can appreciate those coming from the likes of V8 Commodore or Falcon ownership may think otherwise, but after living with a long list of dull and practical family cars, the Stinger is a breath of fresh air just the way it is. To this day, every single time I step into the car it ‘sparks joy’ (thanks Marie Kondo), and I still enjoy the refined driving experience every bit as much as I did when driving it home for the first time. In fact, the more time I spend in the Stinger, the more I come to appreciate it as a real ‘moment in time’ car from Kia, and the brand should be congratulated for having the brass ones to develop something like this in a market that can’t get enough SUVs. 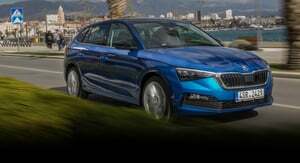 Even though Kia is on record stating it has long-term intentions with this vehicle, I’m not convinced with the conservative numbers being sold that it will be around for a long time. And the fact that there are still very few on the road 18 months after launching, only enhances its appeal to me as an owner, with the car retaining a sense of anonymity and rarity. Just like the Datsun 260Z broke through barriers and changed perceptions of Japanese cars in the ’70s, years from now I have no doubt we will look back at the Stinger as another instant classic, and the one that proved to be a coming-of-age car for Korean car manufacturing capability. Given its comparative pricepoint, I doubt whether the Stinger will ever catch the likes of the Germans when it comes to brand cachet. However, if the Koreans continue to close the gap at the rate this car has, who knows what the brand landscape may look like 10 years from now? The Europeans have successfully entered and penetrated the sub-$50K market in recent times, which was never their traditional domain, and I expect the Koreans and Japanese will take the fight back here by continuing to add premium segment offerings like the Stinger.